Magdeburger Joe.com: "Drank", the New Chill Out Drink. My caffeine days are almost completely behind me. Life used to be an alternation between caffeine buzz and that "comfortably numb" feeling from knocking back slivovitz or Czech Pilsner. Between high blood sugar and high blood pressure, I made the decision that life without so much chemical enhancements beats pushing daisies. So what if I feel out of place in Starbucks. Who cares about those longing stares at the beer section in my local bodega? I've still got rock and roll. And that's here to stay ! So now there seems to be good news on the horizon. There is a new relaxation drink out. It's called "Drank". It contains Valerian root", which has relaxing effects and the smell of really dirty socks, as well as melatonin. It is grape flavoured enhanced with rose hips, which raise its Vitamin C content. Already it has encountered some controversy. 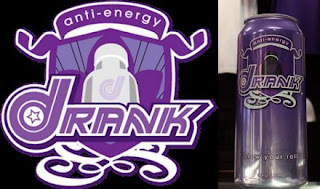 According to the TIME magazine article that featured it, the Drank name "has its roots in Houston's hip-hop scene: "purple drank" is a slang term for an illegal concoction that mixes codeine syrup with soft drinks or alcohol. It should be noted that mixing codeine with alcohol or making any other combination of "downers" is very dangerous. It is in fact a good way to assume room temperature. The flirtation with controversy is a risk that has been gladly taken by the promoters of Drank who hope to make it as popular as Red Bull. Melatonin and Valerian Root are not harmless little placebos. Excess consumption of Valerian root has sparked withdrawal symptoms when use is stopped suddenly. On the flip side, it should be noted that people have been sickened with energy drinks as well. Souping up or souping down your nervous system is not child's play. Herbal medication deserves to be taken seriously and responsibly, whether it is in a commercial soft drink or a home made herbal tincture. I do want to be able to drink a relaxant that will not damage my health. I hope that Drank takes off. So I have a few suggestions for the manufacturers. I want to join in the fun and try some out. So please hear me out. 1) First, lose that high price tag. A reviewer for Consumer Reports complained of paying three dollars a can in New Orleans. That's real steep. 2) Come out with a diet flavour. There are a lot of diabetics, overweight people and overweight diabetics. Don't ignore them. It feels real good when you want a drink and there is something there for you that won't crank up your sugar. 3) Think about courting vegans, Jews and Muslims. A kosher certification will be acceptable to a lot of Muslims. If a product is "pareve", it means that it has no meat or dairy products in it. That automatically takes care of vegan concerns. Imagine a commercial that shows a Muslim in a dishdashah and a chassidic looking guy chilling out playing backgammon and drinking a beverage that is both kosher and halal. Even if Muslims can't drink alcohol, they still want to unwind. That alone is a huge market. 4) A couple of other flavours might be a good idea. But that can wait. 5) If there are health advisories to some consumers of your beverage, be straight up about it. People should have the information they need to take care of themselves. I really wish you all success in launching this new beverage. You seem to have really identified a consumer need. A non alcoholic beverage intended to be relaxing and soporific really has a place in a keyed up urban market. With a little tinkering, this idea could really fly.